The Mahoning Valley Scrappers are pleased to announce four bobblehead giveaway dates for the 2018 season. The full sized bobbleheads include former Scrapper Jose Ramirez, Indians' Top Prospects Francisco Mejia and Triston McKenzie and former MLB Umpire, John Hirschbeck. Join us on game dates Saturday, June 23 (Ramirez), Saturday, July 7 (Mejia), Saturday, July 14 (Hirschbeck) and Saturday, August 25 (McKenzie) for the giveaways to the first 1,000 fans. Gates will open at 6:00pm. 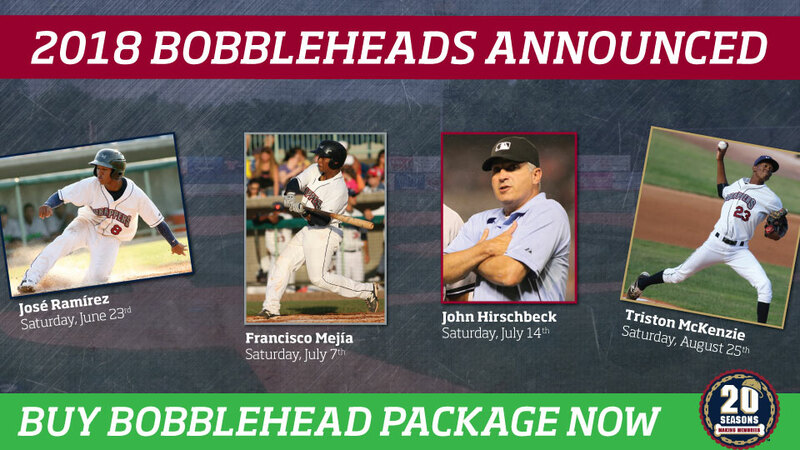 Guarantee all four bobbleheads with the Bobblehead Package, which also includes a game ticket to each bobblehead night and the Scrappers Opening Day on Friday, June 15. Bobblehead Packages start at $45 and are on sale now. They can be purchased online here, at the Chevy All Stars Box Office at Eastwood Field or by calling (330) 505 - 0000. Packages are limited.